My Little Slice of Bliss: Ways With Washi: CHRISTMAS DECORATIONS + a Giveaway! Ways With Washi: CHRISTMAS DECORATIONS + a Giveaway! Hello there, DeNami Friends! It's time for my October edition of Ways With Washi. I don't know about you, but every year I wish I had more time to make handmade gifts and decorations for Christmas. My problem is that I never start early enough, and once I start thinking, "Oh, maybe I should make something fun for Christmas," it's too late. All my other Christmas preparations are much too pressing, and I run out of time. So this year, I decided to start early. I know that we are still three days away from Halloween, but today I'm sharing a few ideas for jumpstarting your Christmas decorating with washi tape. For my first Christmas project today, I made a tabletop Christmas tree. This silver-and-aqua beauty stands about 7.5" tall. Can you spot the washi tape? 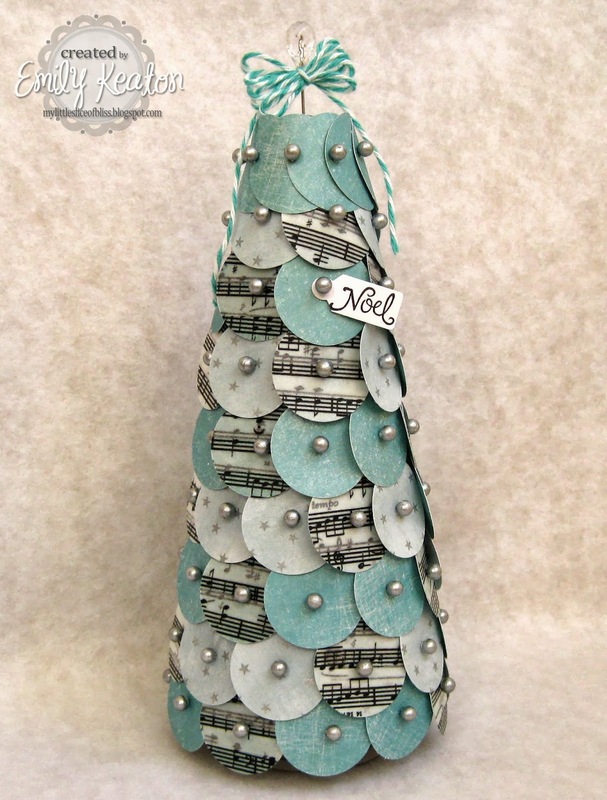 Starting with a Styrofoam cone, I covered the tree with overlapping circle punches. I chose two coordinating subtly patterned papers, dressing up some with overlapping strips of Musical Notes Washi tape and stamping others with DeNami's Teeny Star Background in silver ink before punching out the circles. I anchored each circle with a straight pin from my sewing supplies stash after glamming up the stock white pinheads with a bit of silver nail polish. I finished off my tree with a loopy baker's twine bow (from DeNami's Summer Twine 3-pack) fastened to the treetop with a decorative stick pin and a tiny tag stamped with the Noel sentiment from DeNami's Christmas Greetings stamp set. My second project is a Christmas tree ornament. I started with a clear flat ornament that I picked up for cheap at a local big box crafts store. 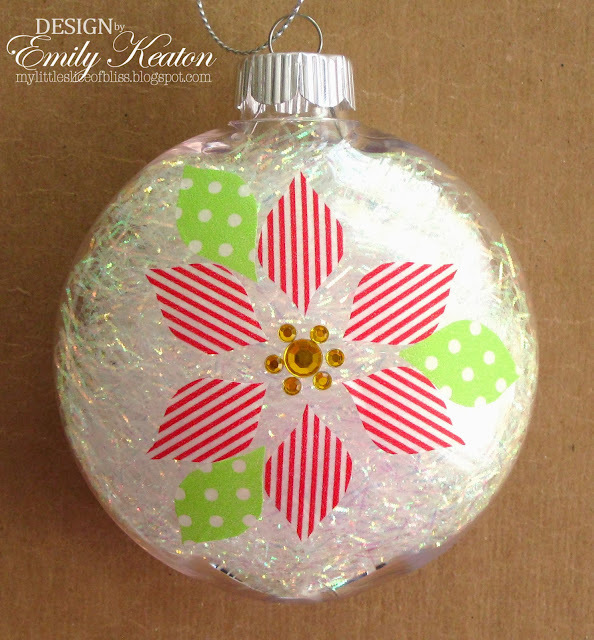 Then I cut out poinsettia petals from Red Stripes Washi Tape and leaves from Lime/White Dots Washi Tape and adhered them to the face of the clear ornament. Can you guess how I made the petals and leaves look so uniform? I stamped a petal from DeNami's Whimsical Garden cling set on cardstock to use as a pattern for trimming my washi tape flower parts. A cluster of amber rhinestones creates a realistic-looking center to my poinsettia. 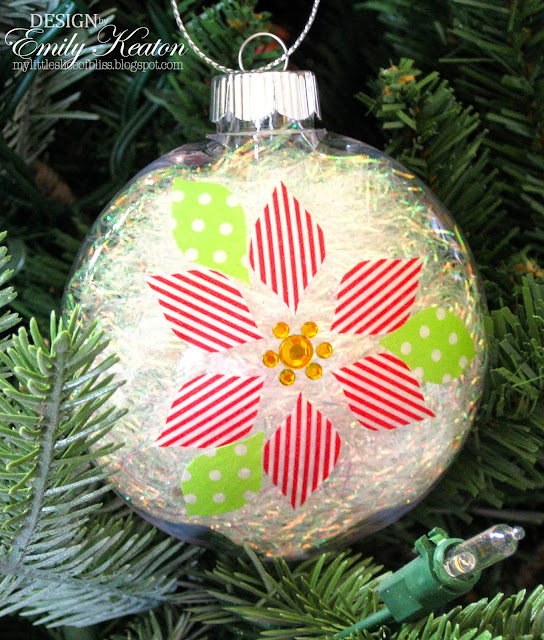 I finished my ornament by stuffing it with some multi-color DeNami Iridescent Shredds for a bit of sparkle. I'll leave commenting open until 11:59 p.m. EST on Wednesday, October 30, 2013, and will draw one commenter at random. The winner will be announced right here on my blog on Thursday, October 31, and if I'm able to find an email address, I'll be sure to contact the winner as well. Thanks for joining me today for some more Ways With Washi! How cool is that tree, Emily, and your ornament so pretty. Now, you can go ahead and decorate your tree..and the rest of your house. I'm a long time follower of your blog with Google. Emily these are brilliant, the tree is fantastic! Love your project. Thanks for the chance to win washi tape! Just signed up to follow your blog! Thanks for the chance to win. Lovely projects. I LOVE the tree. wonderful ideas to DECORATE for the holiday season. I really like the use of the musical notes washi tape. Your tree is simply fabulous!! What a great way to decorate a table or fire place mantle for the Christmas season! Love the ornament too - curious minds must know where the tree prop came from LOL! I love to DECORATE for the holidays and would love to win some tape! LOVE that tree! These decorations are the perfect way to decorate our tree. What a wonderful project for school or a scout troop!!! They would be good to give away to a teacher or shut-ins nursing home patients. This is the cutest tree and ornament. It is nice to decorate with things you have made. I would have never thought to use washi like you did. Thanks for sharing. I follow you with google friend. I'm so happy I found your blog. I did not know those little chickies were DeNami and found out through your blog. Their stamps are adorable. Also found a blogger who used to live close by. Blogland is the greatest! Just love your washi tree! Great way to use up extra tape, if you have some. Thanks for sharing your darling projects. Oh Emily, your tree is so elegant and pretty. I love the colours. And the ornament is so sparkly and fun. The little petals and leaves in the washi are such a clever idea. No need to mess with glue and the pattern makes them even more interesting. I bet your house is amazing at Christmas with all the prett decorations. I'm a follower on blogloving. What great ideas to decorate my tree with handmade decorations---these are beautiful!! You my dear have outdone yourself!!! I love to decorate for the holidays & oh I love that tree, Emily! Now I really want the music Washi tape! Fabulous projects! I am a follower & use Feedly. What a cute ornament!! You have the neatest ideas for washi tape!! I love that you used it to Decorate for Christmas!! Love your pretty tabletop tree and ornament! Very nice way to decorate for the holidays! I'm already a follower here. I follow on Google Blogger! Now that is the best ornament photo! 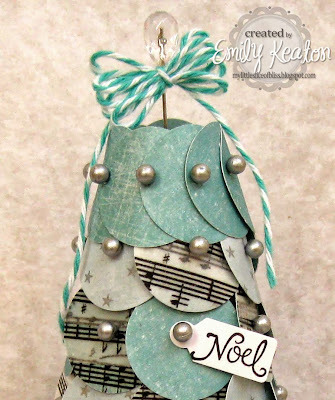 Nestled right in the tree - you rock :) That paper tree is just amazing, Emily - love the colours, the idea, and of course that awesome bow on top! I would love to decorate some cards with washi tape. I am a follower of your blog and would love a second chance to win in the decorate with washi tape giveaway. Oh, my, I just love that tree. Those colors are so trendy to decorate the home. This is now on my "to do" list. Thanks for sharing. I am a long time follower and follow on bloglovin. I miss google reader :( Thanks for sharing.